My end of year break provided me with a much welcomed opportunity to have a dig at a growing pile of books I had wanted to read. One of the books on top of the list: “Films from the Future. 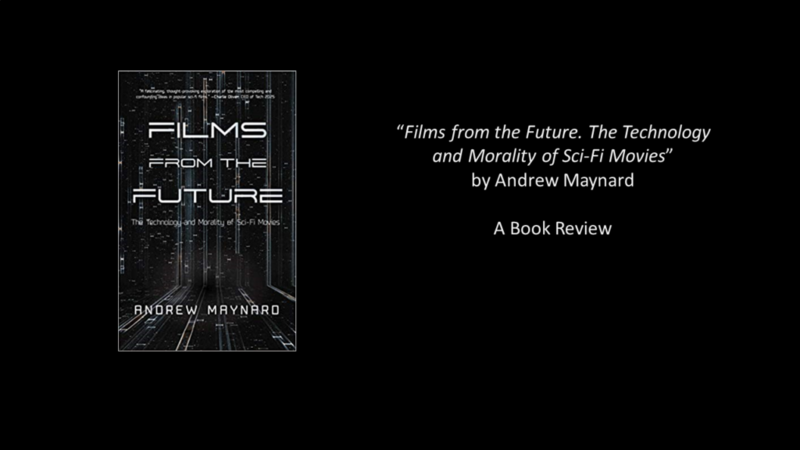 The Technology and Morality of Sci-Fi Movies” by Arizona State University’s Andrew Maynard. The title is somewhat misleading, as it suggests low-threshold, easy for all science through the lens of popular sci-fi movies. Instead, Maynard has managed to produce a very important book – if not a must-read- for anyone interested or actively engaged in the world of innovation, science and technology – if not in fact anyone. Maynard does not engage in an analysis of the top ten sci-fi movies ever made. No extrapolations from Black Mirror episodes, no big philosophical review of The Matrix twenty years after its first release. Instead, Maynard has selected movies – some of them great, some of them less well known or not so great – that serve the purpose of illustrating and, at times, driving the larger narrative Maynard wants to bring the reader. Maynard carefully navigates that larger space that serves as the arena of big and often controversial topics such artificial intelligence, genetic manipulation, overpopulation, climate change – among others. A space that gets defined by science, innovation, technology, organization and ethics. Maynard moderates, where others prescribe. He debunks myths and hypes by means of reasoning that is at times scientific, at times ethical and always honest. He effectively addresses what I call determinist “exponentialism” – a pattern of reasoning that ends up in seemingly inevitable singularities or climate catastrophes and the science activism it can produce. Maynard does not state singularities or climate catastrophes will not happen, nor does he state science activism is a bad thing. But rather than getting obliterated by the no-escape horizon of a black hole, Maynard pulls you out and lets you land back on Earth and has you digest synthesis instead. Maynard addresses such exponentialism as a way of thinking where one is at risk of amplifying current biases in human reasoning rather than moderating it. Maynard never indulges in absolutes (only Dark Lords of the Sith deal in those), but he does counter the attitudes and patterns of reasoning of those that do – whether it is the absoluteness that stems from blind tech optimism, exponentialist determinism or a scientist working in perfect isolation, all of these variations get exposed, carefully and balanced. Indeed – that is not just the core of the matter fore those that find themselves associated with science, new technologies and innovations on a daily basis. This holds true for all of us. Maynard: “It’s all well and good hoping that scientists and technologists act responsibly. But responsibility here also means that we collectively need to give a damn about the future we’re creating, and whether it’s the future we want for ourselves and for generations to come.” Reading Maynard’s book is a great and enjoyable step on that collective and individual journey.